Click on the image to enlarge. Click on the text field on the left to restore. This application offers students and developers to publish their projects developed with hardware description languages, like VHDL, Verilog, SystemC, and etc. Published projects may be used free under GPL and LGPL licenses. This system is intended for design of different types of knitted structures like като jacquard, intarsion and structured (releph and ajure) knittings. It is oriented for users, whom produce hand-knittings for hobby or art; editors of knitting magazines; boutique works designers. The system can be used from ethnographers for keeping motives from knittings in traditional national costumes. First version of the CAD software application is developed using MS Visual C++ 6.0 and MFC library. Tic-Tac-Toe game is a two player game. Every player have own different token. The dashboard is a 3х3 fields matrix. Both players takes their turns, placing their token in one field. Winner is those, who places three tokens in a row, column or diagonal. For this project three kits STK500 with microcontrollers ATmega8515 are needed. 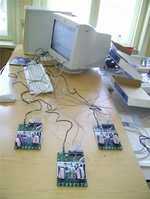 Communication between the microcontrollers is through RS232 interface. For connecting more than two kits a special custom-made cable is necessary for establishing a circular connection: TXD1->RXD2; TXD2->RXD3; TXD3->RXD1; GROUND1->GROUND2->GROUND3. Тhe playing field has 7 positions. There are three black figures on the left, and three white on the rigth. The middle position is empty. This is a one-player game. The goal is to swap white and black figures, using the empty field. No extra hardware is needed for this project. Only the buttons (connected to PORTD) and LEDS (connected to PORTB) of STK500 are used. First seven buttons makes the turns, and the eight one is for restart. LEDs show current state of the game. Graphical symbol constructor for LCD-display, with code synthesis of the assembrer program for displaying. This project is tested on Atmel's AVR Butterfly microcomputer. The program code is programmed with Microsoft Visual C#. On the computer Microsoft .NET Framework 2.0 must be installed. 1. Rewrite of the existing library functions from С language to assembler adding new functions for more flexible control. 2. Change of existing Infrared communication of the robot with the realm (Personal copmuter) with wireless communication. The project is open for new participants in their course and diploma works. A client-server application with FPGA programmable logic. Two Spartan-3 FPGA Starter Kit Board are used. First is the server, and the second is client. The server generates a four digit number and the user controlling the client tries to guess the number with minimal turns.